With the sun overhead and water at their backs Elaine and Phillip united in marriage at the beautiful Paradise Cove. 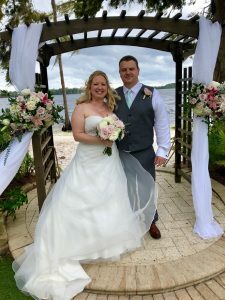 Just across the street from the Walt Disney World Resort, this is the perfect location for your beach wedding right in the heart of Orlando, Florida. Their morning ceremony was the perfect time of the day. The weather was clear, the temperature was warm and breezy; just perfect for their ceremony! The groom and his groomsmen entered the ceremony space on a ski boat coming in to the theme song from Mission Impossible, while the bride and her maids walked down the aisle to more classical music. Blossoms crafted the beautiful bouquet and boutonnieres for our happy couple. With blush roses, peonies, and lambs ear, the flowers accentuated the attire of the wedding party, along with the arch the happy couple stood under. Castaldo Studios captured every moment of the couple’s wedding morning from their arrival at the venue through to their first dance. The artistry of Castaldo’s photographs captured every emotion, every tear, and every laugh, for years to come. Rev.Glynn Ferguson of Sensational Ceremonies worked with the couple to create a custom ceremony to fit the two of them. Their ceremony spoke of love, friendship, loyalty, fidelity and trust. Love is an intense and fulfilling emotion. It allows you to share intimacy and experience feelings of tenderness and warmth. Love takes you out of loneliness and lets you share your life with someone with whom you can express your innermost feelings and thoughts. It was love that brought you together to this moment, to unite your destinies. Always remember just how important your loving relationship is. Cherish your love forever. Congratulations Elaine and Phillip! We wish you many more beautiful days as you grow in love and laughter with one another and as you experience your Happily Ever After.